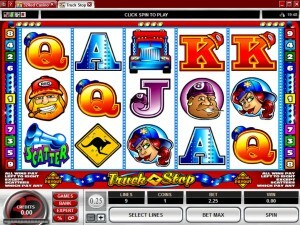 Truck Stop is a charming game, one of the slots that Microgaming has released. Its theme is inspired by truckers and by their big rigs. There are a lot of charming characters among the symbols of this game, along with corresponding playing cards which wear the same hats as they do. The game doesn’t try to be too complicated, on the contrary, as you will learn yourself if you take a look at the few features which are part of it. 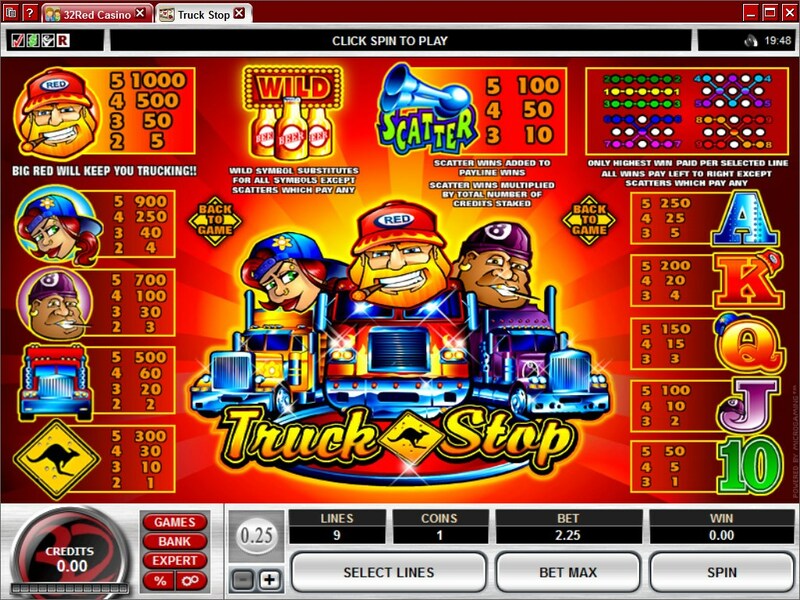 You’re getting a rather simple 5 reel game in Truck Stop, a total of 9 bet lines being used in it, plus only two basic wild and scatter symbols. The prizes are not that big either, only giving you $2,000. You get a scatter and a wild symbol, that’s it. There are no multipliers to be applied to wins, no free spins or bonus games to be triggered, just a wild that helps you from time to time, plus a scatter that will give you prizes. Let’s take a look at the wild symbol first. The image chosen for it is that of three beer bottles. Since it’s a very simple wild, all you should expect from it is that it will be part of new combinations whenever the spot where they land is next to a couple of matching regular symbols. The wild will take the same role as those matching symbols, so the combo forms and you get a prize that wouldn’t have been possible otherwise. Next on the list is the Truck Horn. It’s marked with the word Scatter, so you can’t miss it. You need a minimum of three icons of this type to get paid, and the great thing about it is that as a scatter it forms a combination where it doesn’t matter the exact location, like it would for a regular combo. The game doesn’t ask much of its players, each line bet only requiring a single coin and not accepting more than that. You can use 9 coins for the 9 lines, with the individual denominations being between $0.25 and $2. The maximum bet possible is $18. Big Red, the symbol which awards the jackpot, will put 1,000 coins in your pocket, but unfortunately that’s only $2,000 cash. 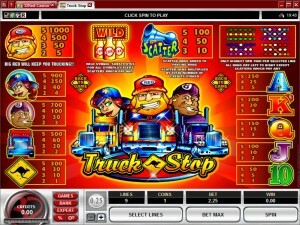 The game is themed around trucks and their drivers. There are a couple of drivers on the symbols, only their heads showing, each one with a different hat. The same hats can be found on some of the playing cards, a nice touch. The slot has all white reels, with led lights separating them. It’s a perfectly fine slot machine to play if you enjoy a nice design. Symbols: Beer Bottles (wild), Horn (scatter, 100x bet), Big Red (1,000x), Redhead Girl (900x), Lucky 8 Driver (700x), Big Truck (500x), Sign (300x), Ace (250x), King (200x), Queen (150x), Jack (100x) and 10 (50x). I wouldn’t recommend you spend too much time with this game, though if you enjoy the trucking theme it might be worth a look. Otherwise, the prizes are much too low, especially since the features give you the minimum possible as well. 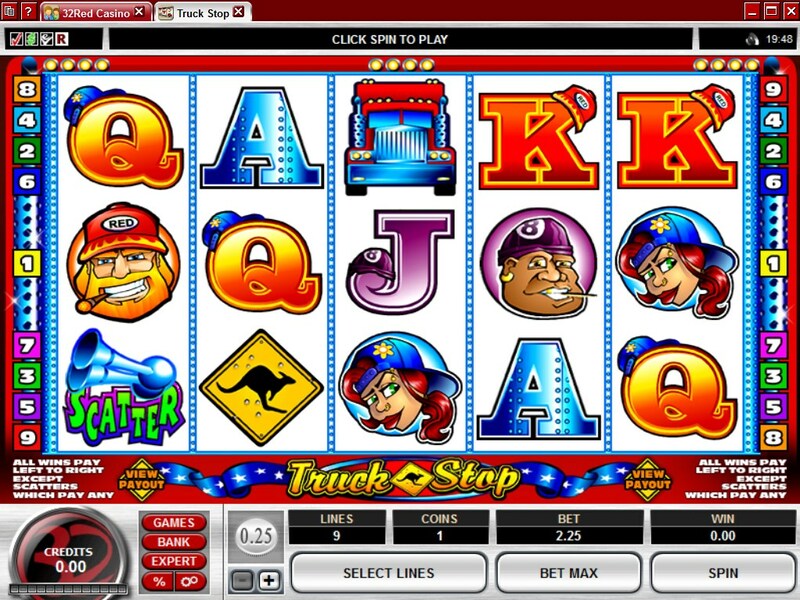 The Truck Stop slot machine is offered through the Microgaming platform, so if you want to play it for real or just to practice, look out for casinos that use it.